We are so lucky to live just a few minutes walk away from W Hotel, I love the design of the hotel and it’s a huge bonus that there are 3 really good restaurants inside as well as a great ‘ post brunch’ bar. 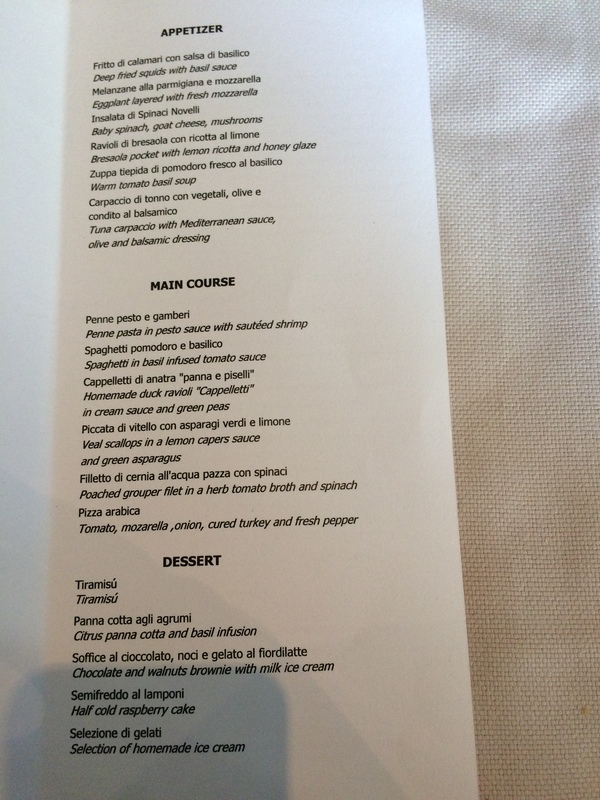 All three restaurants offer a 3 course business lunch Sat – Thur 95QR each which is excellent value and finding ourselves finishing work earlier than usual yesterday we decided on the spur of the moment to go to La Spiga – great decision! The restaurant was fairly quiet when we arrived and as usual we received a warm welcome, the service here is always really good and the staff do look genuinely happy to see you and engage in conversation. There was a good variety to choose from on the business lunch menu which changes regularly and they also sell lovely ‘ muddles’ or mocktails which are always freshly made. 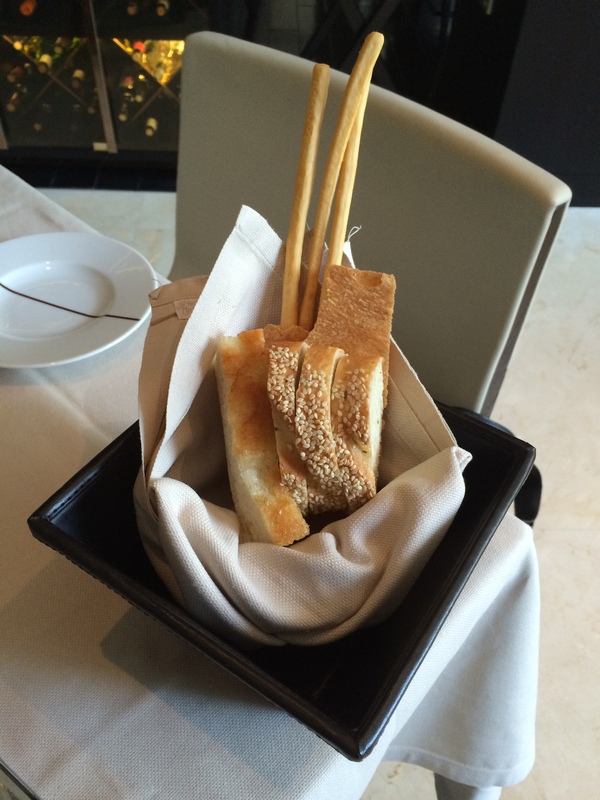 The bread basket at La Spiga is always good and its very easy to fill up on bread before your main meal arrives so try to hold back! 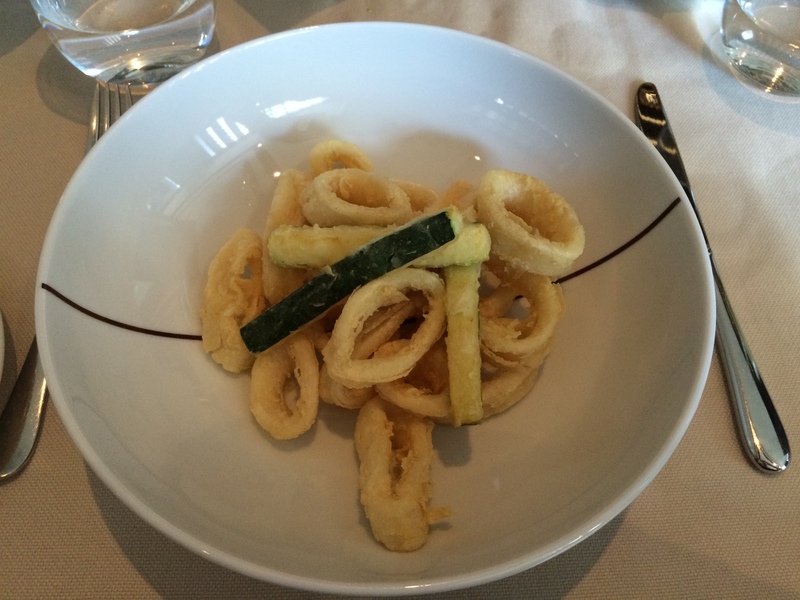 For starters I had calamari, I order this quite often as its so light and crispy and the basil mayonnaise is just so tasty again it did not disappoint. 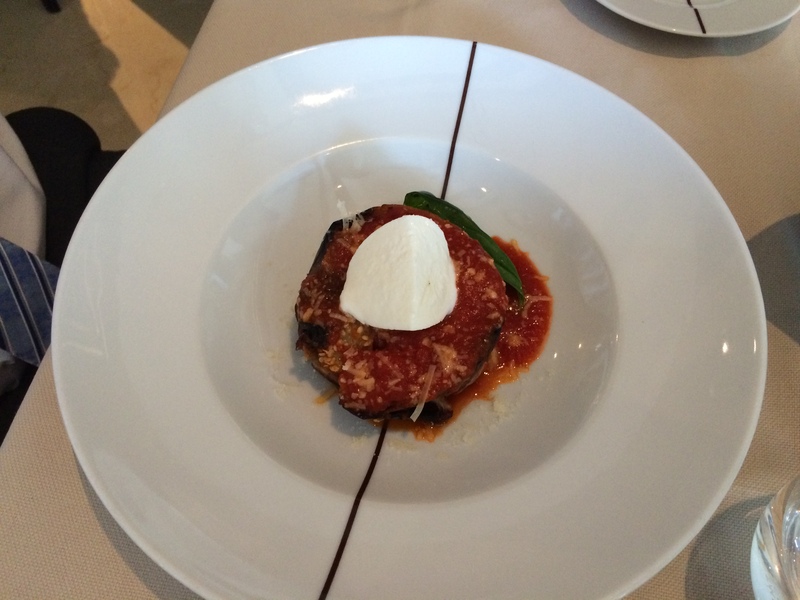 Husband ordered melanzane parmigiana, the aubergine was soft but had kept some firmness and the tomato sauce was sweet with the creamy mozzarella on top. 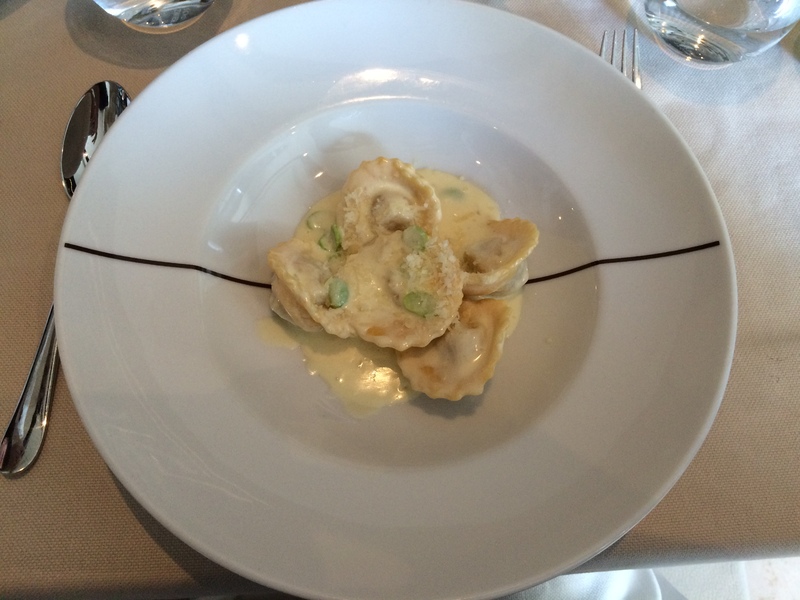 For my main I ordered duck ravioli with a cream and pea sauce. I was worried it was going to be a bit too rich but the sweet, crunchy peas complimented it perfectly, in fact it tasted just like a dish I had eaten in recently in Venice. 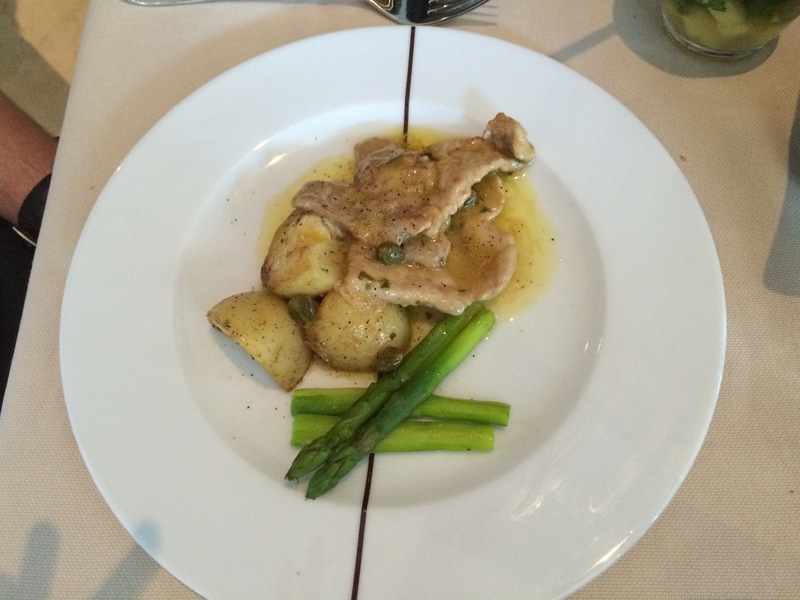 Husband had veal with capers, potatoes and asparagus. The veal was very well cooked but he felt that it needed additional veg or potatoes. For dessert I had semi cold raspberry cake which is one of the strangest desserts I have ever had. 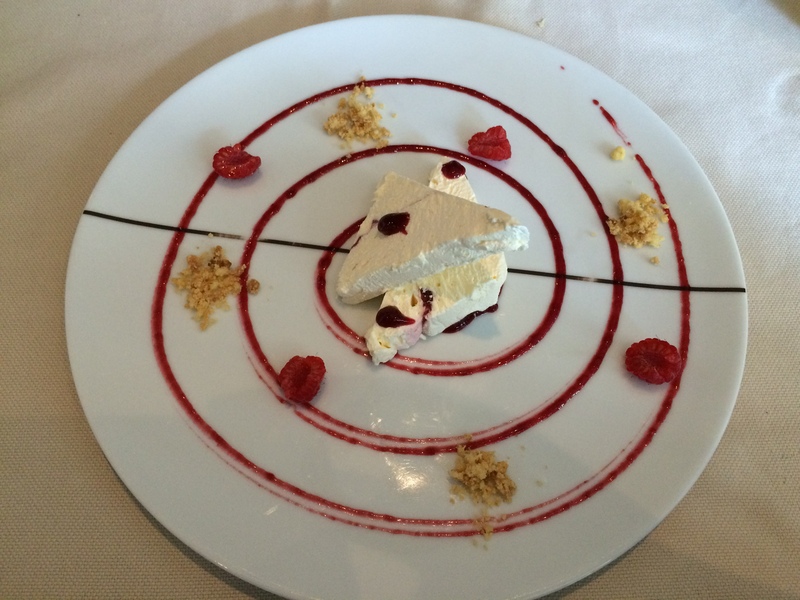 It was absolutely delicious but I could decide if it was a mousse, parfait or ice cream in the end I asked a waiter but he wouldn’t disclose the secret! 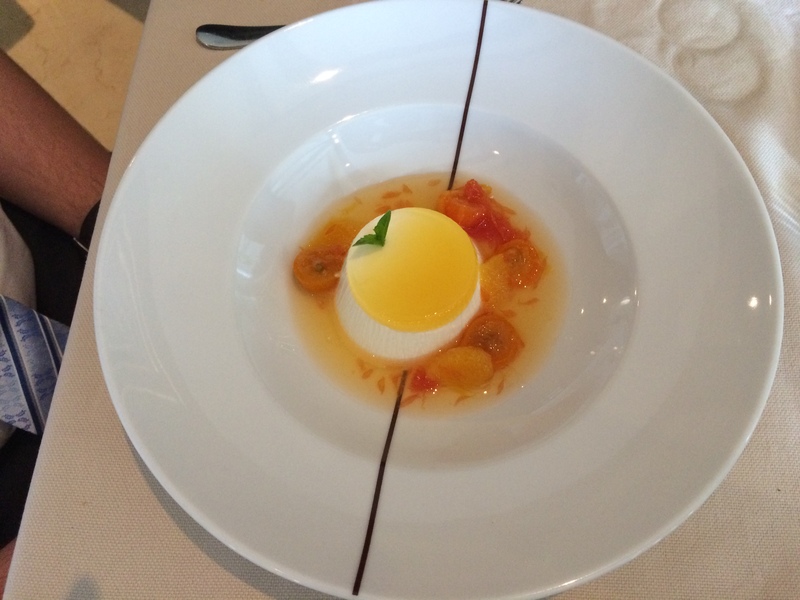 Husband had citrus panacotta which he described as one of the best he had ever had – he said it wasn’t too sweet, not too creamy and the citrus was a good palate cleanser. The food was fantastic and the portion size was perfect, the total bill for bread, 3 courses each, water, 2 muddles and a take away coffee was 290QR ( excluding tip) which is amazing value. I’d recommend the business lunch here, we’ve also eaten off the main menu which was good and been to happy hour – the Grape Escape in which selected drinks are 50% off and you get a free appetiser. Go, you won’t be disappointed!